I’m so happy you enjoyed the banana bread oatmeal recipe and tutorial, so I’m back with a delicious summery oatmeal recipe! I reviewed this company earlier this week and they are amazing! Here’s the video tutorial, so be sure to check it out! Also, just a side note but I’m off to Tokyo on Sunday but will still be uploading video recipes and recipes on this blog every week! And I’ll have some great posts when I get back, so don’t you worry! optional: sweetener of your choice, such as honey or maple syrup (vegan). You can also use mashed banana if you want to keep it refined sugar free! Pour boiling water over oats in a saucepan and cover with lid to soak. 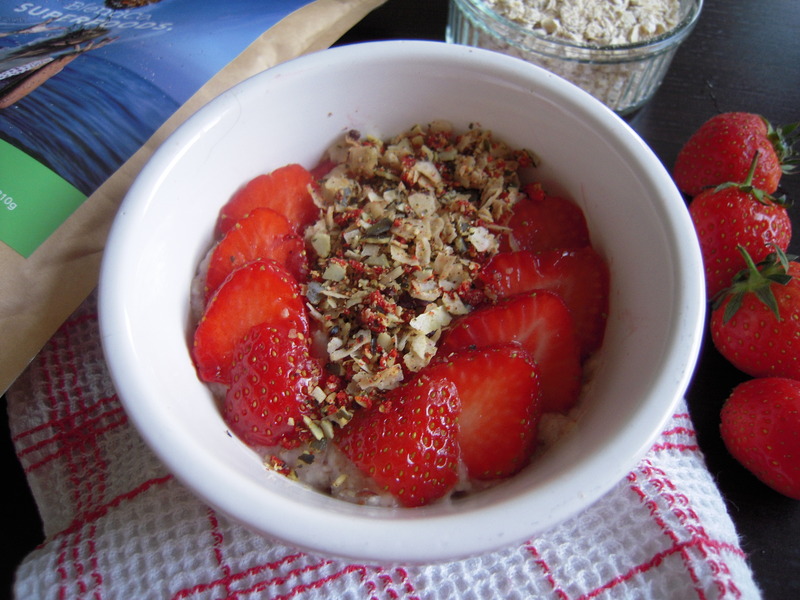 While the oats are soaking, cut the strawberries into cubes. Reserve 2, and cut into slices to place on top. After about 5 minutes, the oats should have soaked up most of the water. Add the flaxseeds and strawberries and cook on low heat until desired consistency. 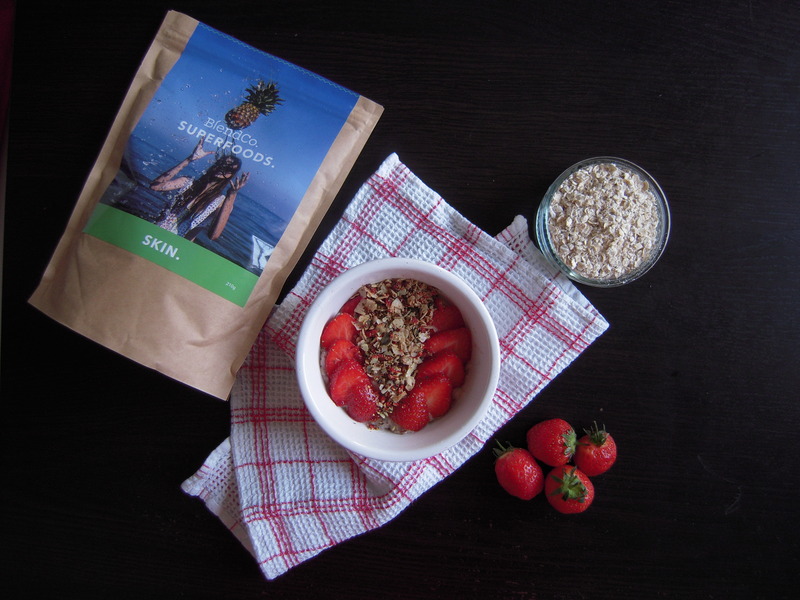 Serve in a bowl and top with strawberries and loads a tablespoon of BlendCo Skin Mix. Thank you Lorraine! I can’t wait – the food is amazing! I have an addiction to oatmeal, too! It’s the perfect breakfast! 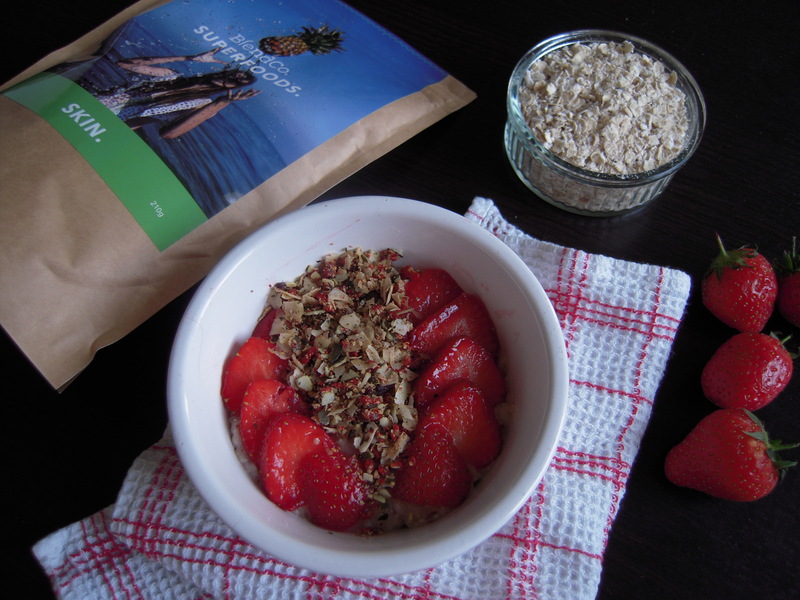 Strawberries and oatmeal, love the combination! I’m having peaches right now, I think I would love that in oatmeal. For some reason, I’m having a hard time finding oats here. Peaches sound wonderful! Perfect for summer, especially if they are ripe and sweet! Oooh that sounds great too!! I love the tartness of blueberries in oatmeal too – so tasty!